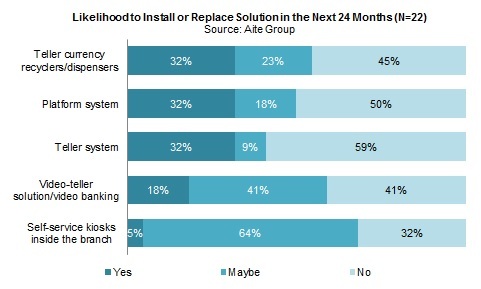 Least satisfied with more mature technologies, retail banking executives are most likely to replace teller and platform systems. Boston, November 2, 2016 – Complexity for the retail bank is at an all-time high as new technologies emerge, customers’ expectations change, and the lines between channels blur. As U.S. financial institutions grapple with slow branch-generated revenue growth and stringent cost controls, they are rethinking their retail distribution business model and right-sizing their branch networks. Next-generation customer engagement solutions are aiming to create a more consistent experience and advanced functionality for the branch channel. While digital channels are taking over after the onboarding process, where does the future of the branch channel lie, and what technologies should be implemented? This 36-page Impact Report contains 20 figures and eight tables. Clients of Aite Group’s Retail Banking & Payments service can download this report, the corresponding charts, and the Executive Impact Deck. This report mentions Accenture, Acxiom, COCC, Codigo, CSI, D+H, Deluxe, Diebold Nixdorf, DINN, Dragnet Solutions, Early Warning, Entrust Datacard, Equifax, Experian, FICO, FIS, Fiserv, Fujitsu, Gimbal by Qualcomm, Hyland, ID Analytics, IDology, Image 4, Infosys Technologies LTD, InLighten, Intellect Design Arena, Jack Henry & Associates, JohnRyan, Kane Graphical, Kiosk & Display, Kontakt.io, LabWerk, LexisNexis Risk Solutions, Lexmark, Misys, Mitek, Nautilus Hyosung, nCino, NCR, Onyx Beacon, Oracle, Reply, SAP, Stelmark, Tata Consultancy Services, Temenos Group SA, TransUnion, TruBeacon, and Zero-In.